That vultures get a bad rap is something of a given. There’s no getting around the fact that they’re weird looking. Birds are supposed to have feathers and birds without feathers look incomplete, like they left home with shaving cream on their ear and toothpaste spots on their shirt. Of course, this raptor pattern baldness exists for a good reason, which is another of the distasteful aspects of vulturine biology. Vultures famously feed on carrion. Dead things. The smellier the better, particularly as, unusually for birds, many species can boast a robust sense of smell. That bald head, so odd and homely, is actually an adaptation for sticking one’s head deep inside the gut of a deceased mammal. Feathers can attract gunk, and gunk means bacteria, and bacteria means illness. The vulture’s head is the teflon surface of the bird world, nothing sticks to it making for easy cleaning. It’s a fantastic adaptation to this particular and essential niche, but given western society’s discomfort with death, vultures were bound to be looked down upon. Once you get past the baldness and the predilection for corpses, you have to admit that the vultures, any of them but some more than others, are impressive birds. The need to travel long distances to seek out dead things necessitates some impressive aerial skills. Sure, they may not have the raw power of a Peregrine Falcon or the agility of a Northern Goshawk, but wager there isn’t a birder out there who hasn’t taken a long look at the Turkey Vulture, an incredibly common species across North America, and wondered at the skill it takes to hang, teetering in the air, without flapping for what seems like and probably is hours at a time. It’s worthy of admiration, if not respect, for this most disrespected of birds. Maybe it’s important to note that Turkey Vultures, in particular, were well-loved by, and even inspirational to, the people that lived here before Europeans arrived. The Cherokee nation called them “Peace Eagles” owing to the fact that they never killed a living thing – and also that they tended to show up in numbers after battled when peace treaties were being signed, though admittedly that may have been for a slightly more macabre reason. In any case, our hang-ups with vultures clearly stem from our own issues rather than any inherently bizarre trait of the species themselves. I’m focusing on Turkey Vultures here because they are undoubtedly the species most birders in North America (the home of 10kB) are most familiar with, but the name vulture applies to birds found around the globe. Here’s the kicker though. 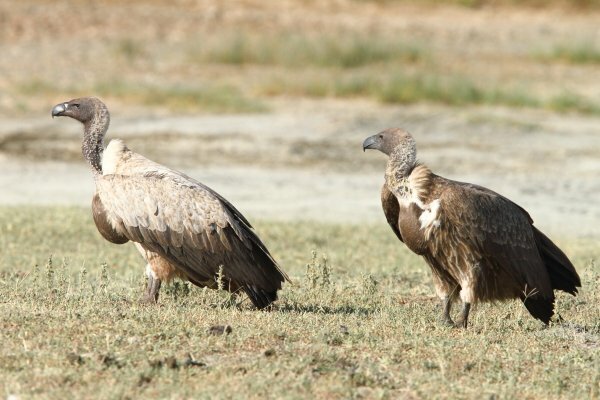 Despite filling very similar garbage disposal related niches, the vultures in North America and the vultures in Eurasia/Africa are really not that closely related. 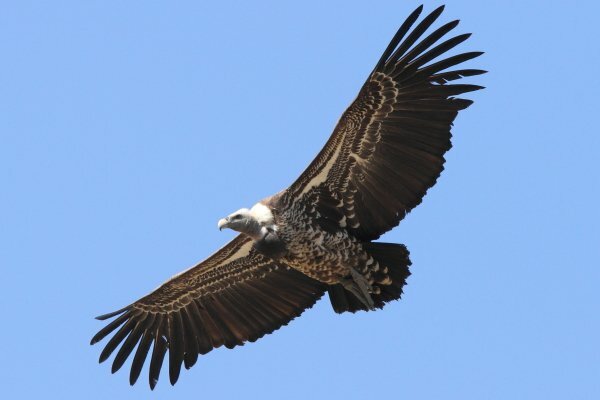 Old World Vultures are nestled within the family Acciptridae along with the hawks and eagles. 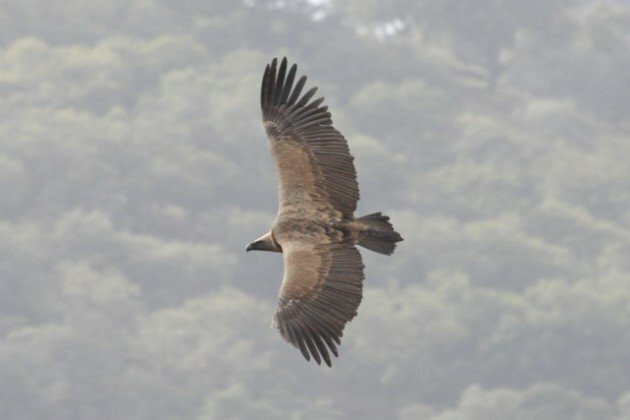 New World Vultures are their own family, Cathartidae, that has moved around a bit with the proliferation of genetic testing such that for a while they were thought to be allied with storks, but is now pretty well within, but not too within, the other diurnal raptors. It’s actually a pretty classic example of convergent evolution, wherein two unrelated families of lifeforms evolve to fill the same niche independently. But if we want to continue to throw a monkey-wrench into this all too cut and dried scenario, there’s also the fact that the Old World vultures had a foothold in North America up until the Neogene about 2.5 millions years ago. But there’s no need to keep pushing. We’ll take these two similar, yet very different groups of birds separately. There are only seven extant species of vultures in the new world, though there have been more in the not to distant past. 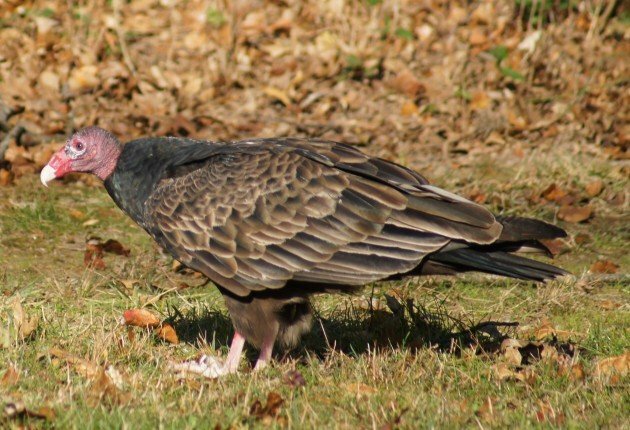 The most widespread species is the aforementioned Turkey Vulture, but it’s joined in the southeast part of North America by the Black Vulture, an altogether more graceless bird who lacks the Turkey Vulture’s powers of scent and essentially follows them around looking to poach their finds. 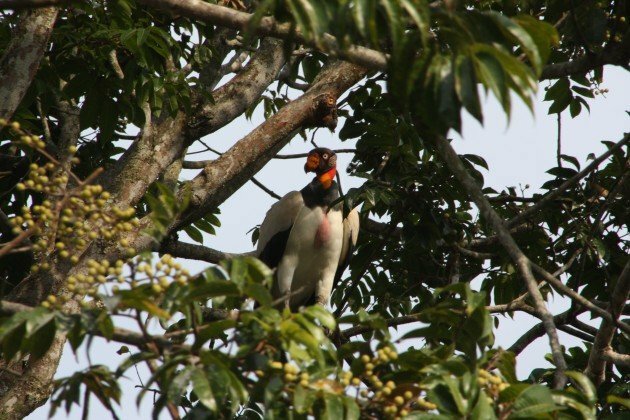 In the tropics, the two yellow-headed vultures fill in for the widespread turkey, and lucky birders can find the objectively spectacular King Vulture soaring on thermals. 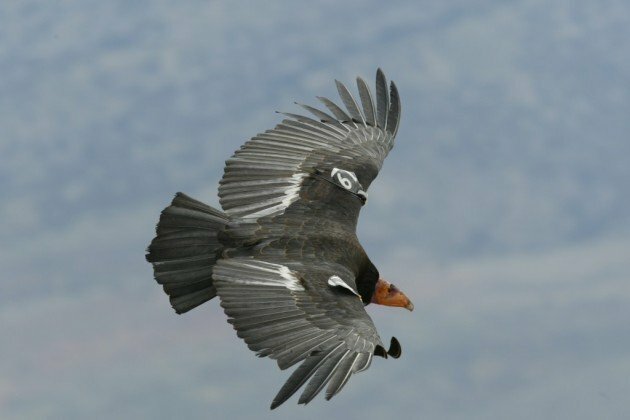 The unrivaled aerial champions of the Americas have to be the two species of Condor, the one-time almost nearly extinct California Condor and the truly massive Andean Condor. Both take vulturing to the extreme with massive wingspans that recall a small airplane more than a bird, and a penchant for dramatic vistas and towering cliffs. The California Condor has a story well-known by anyone with an interest in birds. In the 70s, with the survival of the species in jeopardy, the entire wild population was captured and brought into a captive breeding program in southern California. The program has been successful enough that some of the birds have been released back into protected areas in California, Arizona, and across the border in Baja, but the species is still far from out of the woods. 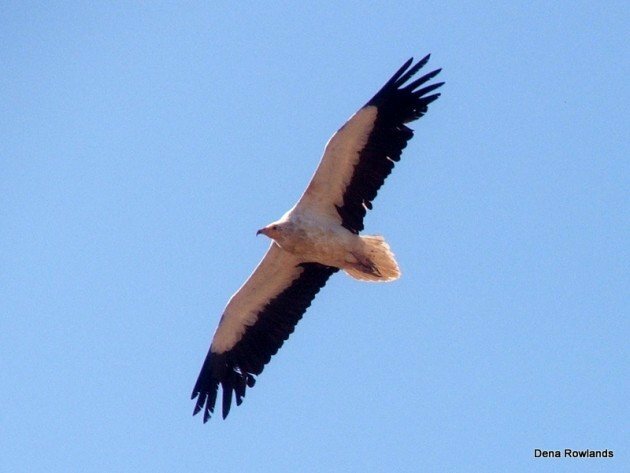 When you see a vulture depicted in a cartoon or some other non-birding publication, this is what they look like. Large, hulking, and menacing, the Old World Vultures, who reach their greatest diversity in sub-Saharan Africa, had a reputation, maybe undeserved, for viciousness. Unlike the Turkey Vulture, who smells out decaying flesh, every one of these vultures forages by sight. And when you think about it, that seems right. The perception of the great bird of prey soaring hundreds of feet above the vast grasslands is an accurate one. They primarily prey on the large mammals of the African plains, grasslands stretching from horizon to horizon. The ability to navigate this ecosystems requires that one see well. One of the more interesting aspects of Old World vulture life is the extent to which they segregate themselves at kill sites. 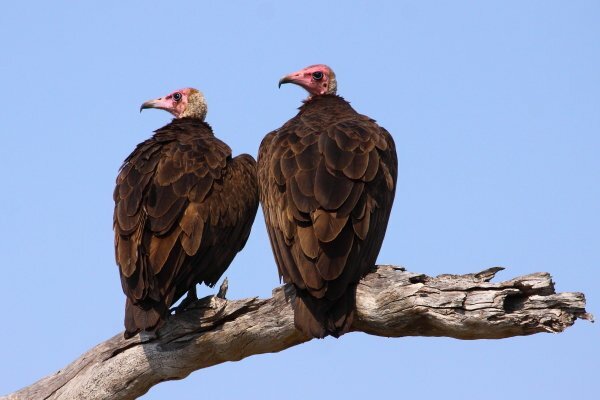 Large species, like the hatchet-billed Lapped-faced Vulture or the large Cape Vulture gets first dips, because they are the only species that can tear open the hides of some of the larger prey animals. 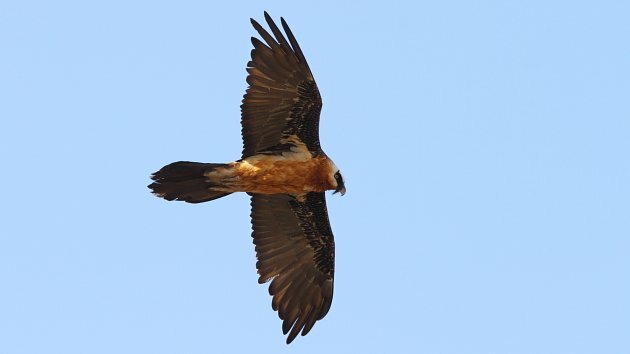 Smaller species, like the Hooded Vulture with it’s dainty bill, poke around the edges until the larger birds have eaten their fill, then dart in to take the next shift. Last, but certainly not least as the saying goes, the barely even bare-headed Egyptian Vultures sneak in to pick up the scraps and wrestle with the bones, which their sharp, small bill allows them to pick the marrow clean. As impressive as these birds are, many species, particularly in southern Asia, have seen precipitous population declines having to do somewhat with the old habitat issues that plague animals around the world, but more to do with the widespread use of anti-inflammatory drugs on cattle, who then die and are eaten by vultures who are poisoned. In parts of southern Asia the population has plummeted 90% or more, necessitating action from local governments, which thankfully came in the not to distant past. It would be a shame to lose these amazing creatures, whose presence is so critical to a healthy environment. So though they may be forgotten and put-upon. Let’s hear it for the vultures. They deserve much more respect than they actually get. I love this issue. I never tire of reading and learning about vultures. The peace eagle story is fascinating. Thanks for including my link. Where Are You Birding This Second Weekend of May 2013? 4 Lions are dead: Sad and all, but does it actually matter? Where Are You Birding This Fourth Weekend of September 2017?